The Venerable' Bede (died 735), a monk of Wearmouth and Jarrow in Northumberland, is best known today as a writer and historian: perhaps his most important work is the History of the English Church, which extends from the arrival of Christianity in Britain, to his own day. This copy was probably made at, and certainly owned by, Rochester Cathedral. Book V of the text begins with an almost psychedelic initial 'S'. 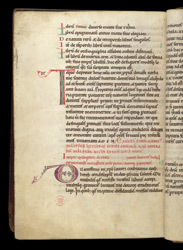 The text is written in the 'spiky' script typical of Canterbury and Rochester in the 12th century. The roman numeral 'xvii' at the lower edge of the page is a quire signature.